This gets Joe’s juices flowing reading this. Joe loves Jason Pierre-Paul to death. The trade Bucs AC/DC-loving general manager Jason Licht made to purloin JPP from the Giants for a third-round pick may go down as his best deal. Even America’s Quarterback, Pro Bowler Jameis Winston, said if the Bucs had 51 other players with JPP’s attitude, the Bucs would win games. Wonder who Jameis was throwing shade at there? But JPP turned 30 last month and his contract expires after the 2020 season, so who knows how much longer he is going to be around? Joe has been smitten with this Jason Allen out of Kentucky in a big way, especially with the Bus holding the No. 5 pick in the draft. After reading what NFL.com analyst Daniel Jeremiah typed about Allen, Joe’s worked up this morning as if Joe already slammed two mugs of Community Coffee Breakfast Blend. Allen is a tall, long edge player with tremendous agility, versatility and production. As a pass rusher, he wins with speed, bend and a nifty inside counter move. He doesn’t possess a lot of power, but makes up for it with his Gumby-like flexibility at the top of his rush. Against the run, he uses his length to set the edge and he’s a blur closing from the back side. Allen is a huge asset in coverage, providing the athletic ability to mirror backs and tight ends all over the field. 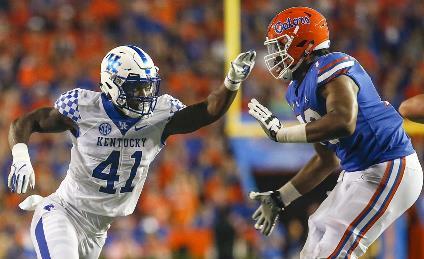 Overall, the Kentucky product possesses an ideal skill set for today’s game: He can run, rush and cover. So Jeremiah has Allen ranked as his No. 3 talent. The interesting thing there is Jeremiah does not rank any offensive players in his top-five. You just know someone is going to draft a quarterback or trade up to draft a quarterback. Is it possible the Bucs may just have a shot at Allen at No. 5? I would LOVE to see *Josh* Allen tearing up the NFC South QBS in pewter for the next 10-12 years. I mean anything is possible. But it’s february, so probably don’t get too worked up about the draft which isn’t for a few more months. Let’s free agency first. Not convinced. Not a high priority. Have JPP & Nassib. Ot, CB, DT, LB bigger need. I am with you Tom,and I would also add a RB………with JPP and Nassib we are good!!! Jpp can move inside for some snaps. He played tackle at times last year. You need guys who can get after qb and this guy could be solid. Shouldn’t matter where pressure comes from , you just need pressure period. Just don’t think he makes it to us. We could probably get away with not drafting a DE in the 1st round, maybe even the draft depending on who we retain. However, Allen is a talent. It might be difficult to pass on him if other positions are not available. Agree that free agency comes first. Also, trading down a bit might be advisable again this year. Wouldn’t assume so but it would be nice. Still hope we can get Oliver at 5. Guy is nothing but a motor speed boat shuts down QBs and RBs in the backfield and never stops going full speed till the whistle is blown. Him and Vea in the middle could be killin it for many years to come. allen is nice but we need to go DT in the first….ed oliver or q. williams-DT….zach allen-DE in the 2nd round….martez ivey/tytus howard/chuma edoga in the 3rd…. imo first 3 picks have to be trenches…. This draft is pretty loaded with DL talent. So even if the top 3 hype is real with Allen its not a huge deal. Add Montez Sweat to that list too. So many good D Lineman, the best could end up going to an already great team. Unless those great teams take anyone of the 10 elite ones in this draft and coach them the best, which is exactly what has been missing in Tampa since Dungy/Gruden. I don’t think we can miss in this draft if we end up picking at #5. If we trade down, please,please,please take the overall rated prospect at the position, like Greedy or Devin. So are you sure he is not like another Noah Spence? Mostly trade down if possible, Devin White mid round , NO Cornerbacks in round 1!!!!!!!!!!! Josh Allen and Nick Bosa are probably the first 2 picks unless a team trades up for a QB. In a 1-gap scheme which Bowles said he will run, we are going to need additional pass-rushers (edge and interior) which this draft is loaded with. I absolutely expect a trade down for additional picks. Agreed trade down no db’s in first rd ADDRESS THE TRENCHES. GO BUCS!! I’m in on the Montez Sweat, Brian Burns, Jachai Polite recommendations as well as maybe a Jaylon Ferguson, all after a trade down. Maybe Noah Spence is revived under Bowles!! If we don’t stay at five I’d be down to trade down twice in the first and stack up on picks. Finally got a coaching staff that knows what good players look like, also. If Josh Allen is available at 5 the Bucs should absolutely stay at 5 and pick him, unless they were offered something ridiculous. In a 3/4 defense The Bucs would have him starting at OLB with Nassib at DE and JPP on the other side with Lavonte David. In a 3-4, which probably WON’T be their primary defense, Lavonte is kicking to inside linebacker. Kwon or Beckwith will man the other spot. Rushing LBs would be needed so Allen, along with some other Edge rushers, would become a need. JPP and Nassib will not be the DEs in a 3-4, we would be torched by teams running the ball against us then. That’s why I also like a guy like Quennin Williams or Christian Wilkins to replace GMC and be an interior pass-rusher, either a 5- tech in a 3-4 or a 3-tech with four down linemen. If we can get Sheldon Richardson in FA (depends on Bowles too) to play that position, I’d like to take an Edge-rusher in Rd 1.
robert, not great at anything?! clearly your lack of football IQ is showing again. The dude had 17 sacks last season. Joe I been pushing for this kid hard!if he doesn’t have much power that’s something he can work on.if the talent,speed and coverage skills are their then there isn’t anything a few weight sessions can’t fix in his power.this kid looks like he’s JPP 2.0. I honestly prefer him over Bosa. Raiders are posting articles that they could potentially take Josh at #4. CBS has a mock where we trade down with JVille and pick up Jonah Williams. Granted this is CBS and they don’t know sports. That shade might be against himself. 51 more players like JPP means that everyone not JPP are getting shaded by the QB even himself. Because he is part of the team of 52 right? And if JPP is 1+51= 52. So my hat is off to Jameis Winston for being straightforward with the fans calling everyone out including PRO bowl QB alternate, America’s QB, Jamise Winston to up their passion to play in the NFL. Great reporting on this story. Joe I love the headline. Ideal is exactly what this player is. Some fans are getting too hung up on positions, I think, so they are claiming that LT is our biggest need. These fans are dead wrong. They are not looking at the full scope…….even when it smacks them right in the face…………………….What I mean by that is our #32 ranked defense. It is blantently obvisous that our biggest need is on defense. Right now we only have one game-changing player on defense. This is the problem. We have a dire lack of playmakers on defense. We need a elite player on defense very very badly. This is the biggest need on the team and it’s not even close. Let’s remember that our one playmaker on defense is over 30 years old and cannot do all the things he once could. Right now the defensive roster is close to a flatline. We need somebody to come in here and change all that. Breathe new life into the defense and establish a fresh attitude. The beautiful thing that one biggest need doesn’t have to be pigeonholed into one specific position. It doesn’t matter which position. If they can be elite and stop the pass it will make the biggest impact of any other player in this year’s draft!!!!!! Ideally you want a Front 7 guy and the best part about this draft is that’s exactly what’s strongest(BPA) at #5!!!!!! Easiest pick in franchise history. If you want this guy to make it to 5 you better send him a bong and a camera right now. Otherwise, not happening. Bosa, Allen or Q Williams are dream picks, but unless two QBs get drafted early, none of these guys are around. This is shaping up to be a trade down draft. There is great value on defensive and offensive line throughout the first round. If Licht could turn that #5 pick into two later first round picks, that would be a huge win. Gruden might get infatuated with Kyler Murray, who won’t be around for their second pick. The draft value for 5 would be both of their firsts and their third. 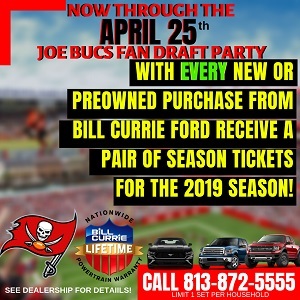 Don’t think they would go for that but if so…..
Lol would be the Bucs luck to see Williams, Allen, and Bosa all taken before us… At that point I’d try to trade back a couple picks and take Ed Oliver.